1.It is absolutely an excellent anti-theft backpack.It is hard to the bad guys to steal your stuffed in the backpack and perfectly secure your stuffs well. 2.Special material with Water Repellent outer fabric can protect your stuffs inside the backpack against the sudden rain. 3.Double Layers of padded compartments for 10.1" iPad / Tablet and 15.6" laptops / notebooks,avoiding the bumps,scratches and hits. 4.Its appearance is simple but fashionable.Insider, its assorted pockets are organized to well store everything neatly and handily. and elastic band,which is convenient when your hands are busy; (2) The sunglasses can be hanged into the loop. 6.The top handle is embedded with thick foam,which is really easily and comfortably carrying around.it could also be fixed onto the luggage pull- along handle to make your business/travelling easy and freely. 7.The back panel is constructed ergonomically and it is fully covered by mesh,which make the backpack breathable and air-ventilating. 2.Fit 10.1" iPad / Tablet or smaller. 3.Fit most 15.6" laptops or smaller.Note: The same size in 15.6" laptops with different brands may different in specific size.Please consult us before purchase if you are not sure. 【Top Concern】This series of OUTJOY anti-theft backpack specially has been improved in Zippers and Shoulder Strap. You will not worry that the straps are easily torn as we upgraded straps' construction to make it more durable. The zippers' teeth are additionally covered by a layer of fabric to make it hidden and to avoid their broken or stuck issue with the long-term continual use. OUTJOY stand behind product so please rest assured to have a joyful purchase. 【External USB Port & Phone Holder】 Simply Power on External USB port by connecting your own power bank, and collaborate with the built-in phone holder(suction base on the straps) that will offer you a convenient and fast charging with your hands free when on the move or having a phone chat. 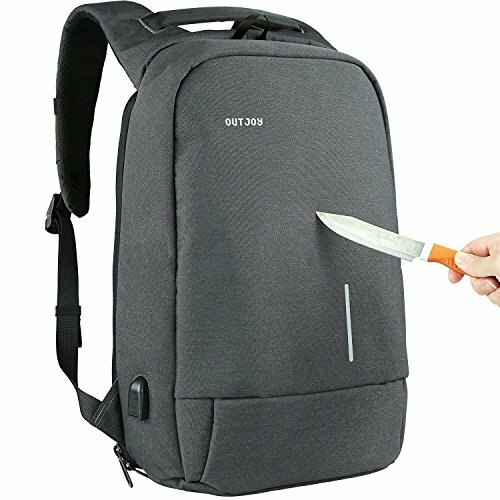 【Water Resistance & Wear Resistance & Anti-Theft Feature】OUTJOY commuting backpack is made of premium water repellent and rip resistant polyester to a large extent to protect your stuffs inside from getting wet in a short rain, and it is safe and sound when it encounters careless scratches. There is a hidden zipper portal into the insider of the backpack so it is well leave the theives away. 【Two Cushioned Protective Compartments for Laptops / Tablets】There are two separate compartments fitting 15.6 inch laptops and 10.1 inch tablets accordingly. Each side of the compartment is fill in with protective cushioned foam that can protect your laptops from scratches and hits. If you have any questions about this product by OUTJOY, contact us by completing and submitting the form below. If you are looking for a specif part number, please include it with your message.